On a shelf in our living room where Jae and ElDad store books they never read I have lined up my collection of Easter eggs. I have 7 (plus 2 mini creme egg sized ones) in total including a Dr Who one, a Glee one (with free mug! ), a Galaxy one and a Creme Egg one. 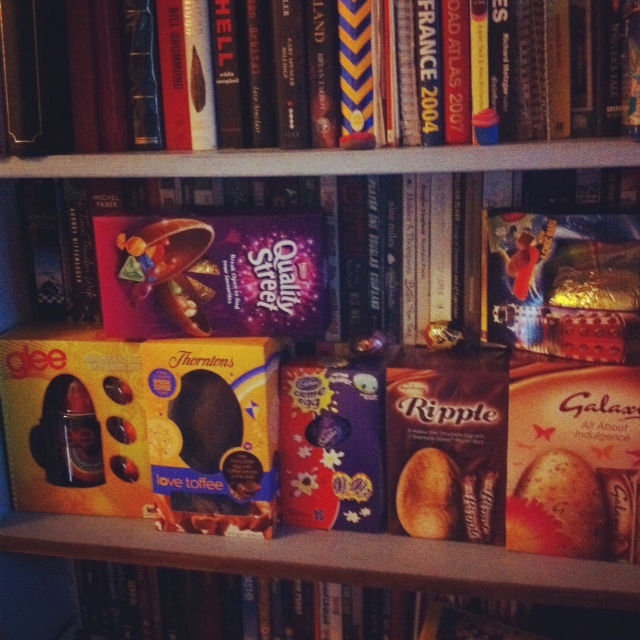 I’m not intending to eat them ALL on easter sunday alone however I am going to eat A LOT!!!!!!!!!!!!! So, what do you do to avoid that dreadful sore feeling you get after stuffing yourself with the sweet stuff? Errrrrrrr… Nothing! That’s the best bit! Happy Easter from us and our glasses! April 7, 2012. Tags: chocolate, Easter, eggs, stomach. Random wisdoms, Stuff we love, Top Tips. 1 comment.